I so enjoyed Marty Wingate's delicious English cozy "Empty Nest" that I asked her to be a guest here on Mystery Lovers' Kitchen. 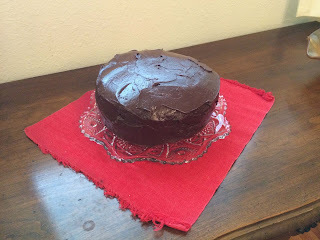 A chocolate cake featured quite prominently in the book and every time it was mentioned, I drooled at the thought of a delicious piece of cake and a cup of tea! I managed to convince Marty to share the recipe with us today! Julia Lanchester finds it difficult to resist chocolate cake – especially the kind made by Nuala Darke, who runs the tea room in Smeaton-under-Lyme, the village where Julia manages the Tourist Information Center. I set my Birds of a Feather mystery series in this fictional village in the real county of Suffolk, England. Birds infuse the stories – how could they not, when Julia, the protagonist, is daughter of the celebrity ornithologist Rupert Lanchester (he’s got his own television show). But the books (#1 – The Rhyme of the Magpie; #2 – Empty Nest; #3 – now under constructions) are also filled with quirky characters, a bit of romance, food, and – of course – a murder, which Julia feels compelled to investigate. Julia loves to eat and she’s one of those people who can eat constantly (it seems) and never gain an ounce. Although all authors put a lot of themselves into their characters this one trait is, sadly, where Julia and I part ways. 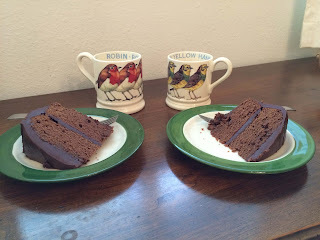 So, on to the chocolate cake, which you will read about in Empty Nest (along with Nuala’s other tea room treats, such as cheese-and-bacon scones). The recipe below is my own version of a cake that is served in many of the National Trust cafes around Britain – it’s incredibly chocolately and amazing good. 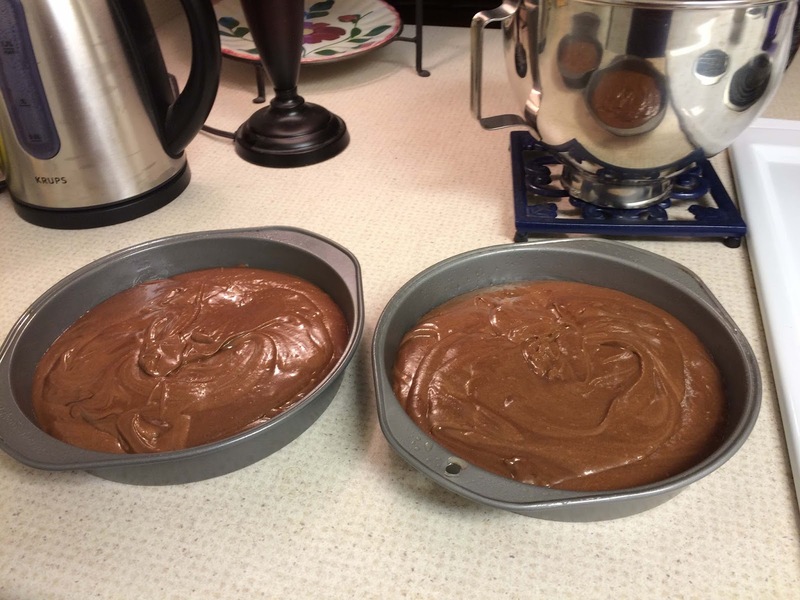 Be sure to check the size of your cake pans – they should be on the small side, only 8 inches in diameter. I hope you will try the recipe out and also read about Julia’s escapades. I’m just finishing up #3, which will be released early in 2017. 1. Set the oven to 325 degrees F and butter/oil/spray two 8-inch cake tins. Line the base of each with parchment paper. 2. Put the chocolate, half the sugar, and about two-thirds of the milk in a saucepan. Set it over low heat and gently stir until the chocolate has melted and the sugar dissolved. (It should not get hot, only warm.) Set aside. 3. 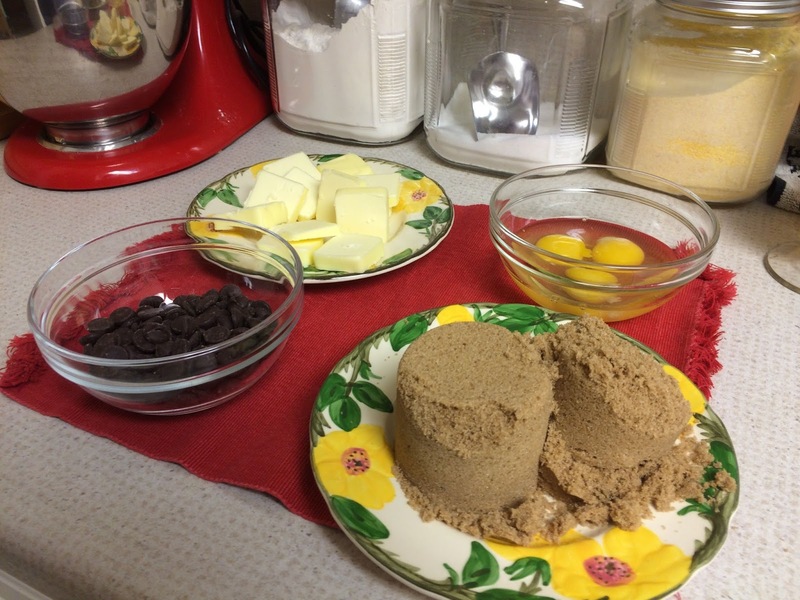 Sift together: flour, baking powder, cocoa, and salt. Set aside. Put the butter and remaining sugar in a mixing bowl and beat. 4. Gradually beat in the eggs and vanilla. Fold in the flour mixture in three stages, alternating with the remaining milk. Fold in the warm chocolate mixture, finishing it by hand. 5. Divide between the prepared tins and bake for 40 minutes or until the sponge springs back when lightly pressed. Cool the cakes in the tins for about 10 minutes, then turn out and peel off the parchment. 1. Put the chocolate in a bowl over a pan of just-boiled water, off the heat; stir until melted. OR microwave in a glass bowl on low in 20-second increments, stirring each time until melted (it gets warm, but not hot). 2. Once melted, put the cream in a small saucepan, bring to the boil, and pour into the melted chocolate. Using a wooden spoon, first stir, then beat (be careful not to slosh it on yourself!) until combined and glossy. Cool. Just as it’s finally cool, if it seems too runny, use a wire whisk and beat it. 3. When the cake and ganache are at room temperature, place the first layer on a plate (put a blob of ganache on the plate to help the layer hold still), spread some ganache, then set the second layer on. (I find it easier to set bottom-to-bottom so there’s no gap between the layers.) Cover the cake and leave in a cool place to set. *I was delighted to find that Nestles sells a bag of dark chocolate morsels – more chocolatey than the semisweet chips. This is what I used, even though chocolate chips take a bit more time to melt than if you chop a block yourself. In the meantime, here’s a giveaway offer from my other series – the Potting Shed mysteries (about an American gardener who moves to England and digs up more than weeds). 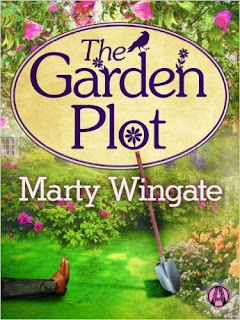 I have a copy of the audio version of book #1, The Garden Plot – free to the lucky winner who will be randomly chosen. To enter the drawing, leave a comment below – and be sure to include your email address. I’ll contact the winner. And visit my website (http://www.randomhousebooks.com/authors/marty-wingate/) to sign up for my occasional newsletter with news about books and England. You can find all my books – including Potting Shed #5, The Bluebonnet Betrayal (coming out August), in all ebook formats – Kindle, Nook, iBookstore, Kobo, GooglePlay and more! 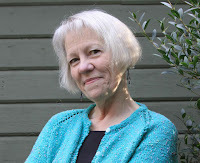 Marty Wingate is a Seattle-based writer and speaker who shares her love of Britain in her two mystery series. The Potting Shed books feature Pru Parke, a middle-aged American gardener transplanted from Texas to England, and Birds of a Feather follows Julia Lanchester, bird lover, who runs a tourist office in a Suffolk village. Marty writes garden articles for magazines including Country Gardens and the American Gardener. She is a member of the Royal Horticultural Society, Mystery Writers of America, Sisters in Crime, and the Crime Writers Association. She leads garden tours to England, Scotland and Ireland, spending free moments deep in research for her books. Or in pubs. Thanks! The Bluebonnet Betrayal takes place at the Chelsea Flower Show - I had a great time writing it. At the moment, I'm finishing up #3 Birds of a Feather. You can't top that ganache icing! It's amazing what Pru Parke can dig up in a garden! Oh, this is definitely my next dessert. I am just now getting into audiobooks. I can bake my cake and listen to the story at the same time...perfect! The reader (Erin Bennett) is fantastic - she brings my characters to life! Thanks! I hope you'll enjoy both series (Potting Shed and Birds of a Feather) - Pru and Julia are quite different characters! 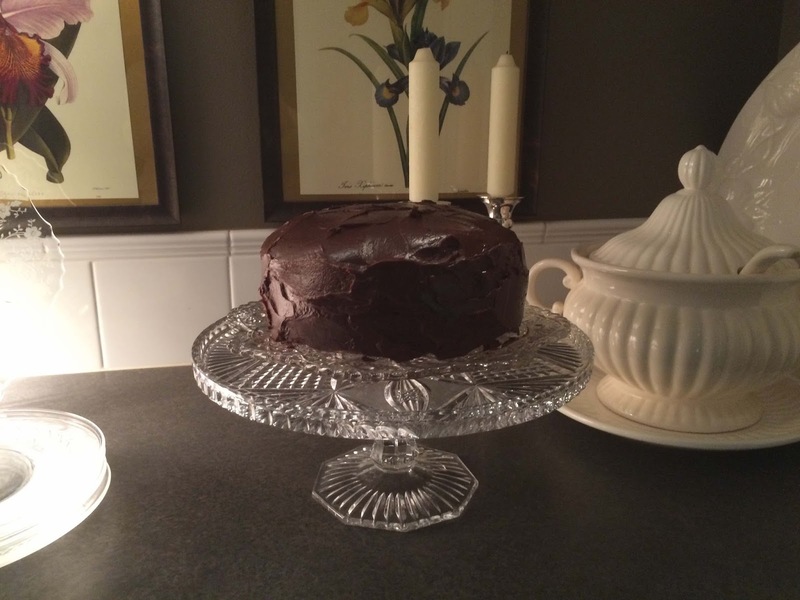 It's a chocolate wonder, and the cake texture is lovely - soft, dense, but not too heavy. Yummy chocolate cake. Thanks for the recipe and the giveaway. Be sure to send your email address for the giveaway! I love Emma Bridgewater pottery! I try to bring home one mug per trip. I just wrote a scene in Birds of a Feather #3 with Julia eating this cake. And I'm making one for a dinner party in two weeks. Yum! Chocolate cake may not photograph well, but it sure tastes fabulous! Thank you so much for being our guest today, Marty and for the awesome chocolate cake recipe and generous giveaway! I can't wait to make that cake for the next family gathering. Thanks, Peg - this is great fun! Okay, it's 7 a.m. and I want cake! Sounds delicious. The books are so much fun, love the settings. And audio books are great for walks and to make exercise almost bearable. Thanks for the giveaway.